I have put up some repertoire for you to print out for our first rehearsal on Tuesday Feb 4. Head over to the repertoire tab on the website – if you click on the titles of the first four pieces, that should open up the corresponding pdf files. P.s. 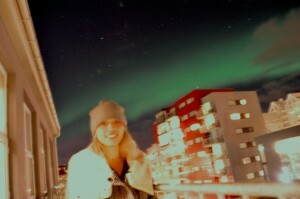 Here’s a pic of me with the northern lights at New Years! Wahoo!